Many versions of this recipe suggest it as a breakfast or brunch dish. I personally think it makes a nice lunch or dinner, too! I took a traditional recipe and spiced it up. You can season however you like, but this version is quite tasty. In a large skillet, heat the oil, add jalapeno, onion, garlic and bell pepper and cook until vegetables are softened, 3-5 minutes. Add the roux to the pan and stir until incorporated. Add tomatoes oregano, cumin, hot sauce, salt and pepper. Bring to a simmer and let simmer about 5 minutes. Gently add the eggs, one at a time, cover and cook until egg whites are done. You can cook the yolks to your desired doneness. 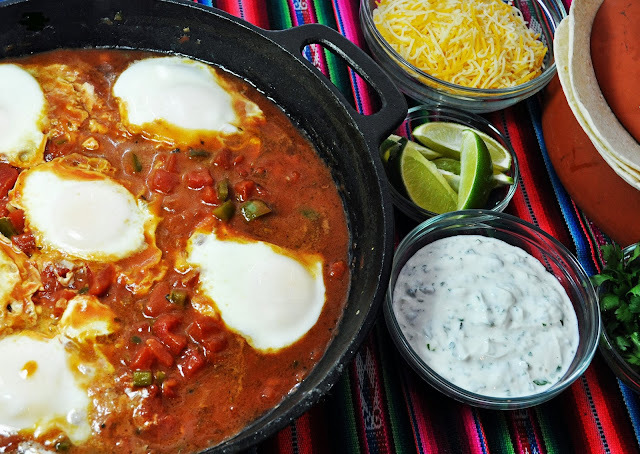 Serve 1 egg on each tortilla, surrounded by sauce , topped with cheese and cilantro cream. Serve with additional cilantro leaves and lime wedges, if desired. Stir yogurt, lime and cilantro together, salt to taste.